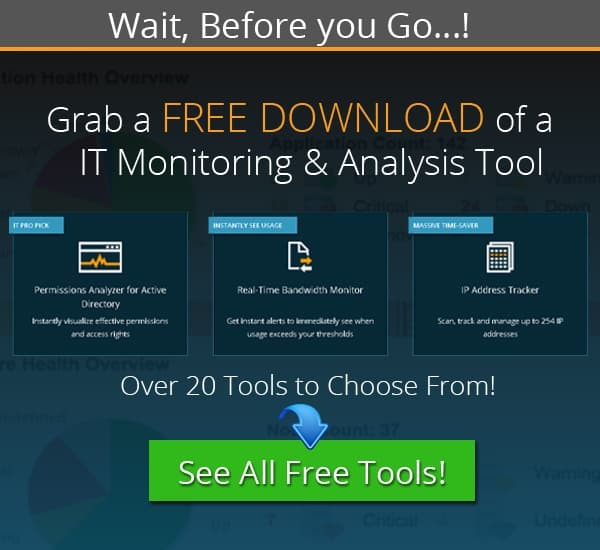 Best Network Traffic Generator Software & Tools for WAN & LAN Testing! If you have ever commissioned a new network, then you will know how important it is to benchmark the environment before it is signed off and brought online. Likewise, it is a good idea to Stress Test and Generate Network Traffic on existing networks to try and find any areas that need attention, such as packet loss and connection drops. Network Traffic is essential for businesses if they are going to run well enough to keep your data flowing and your applications communicating correctly. 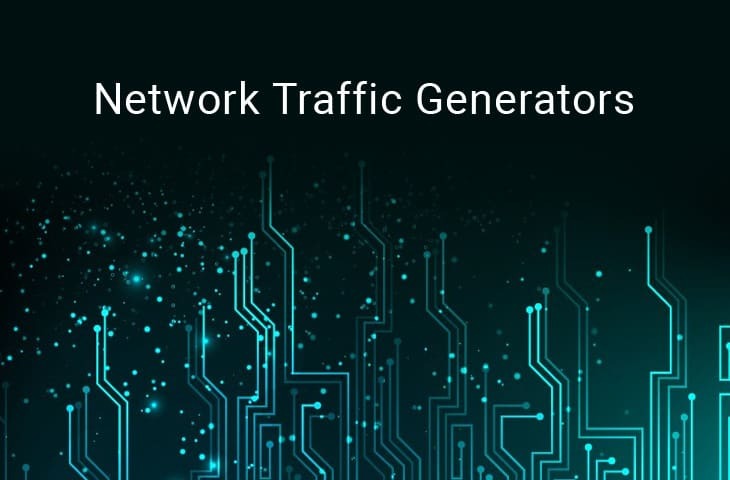 This is where a Network Traffic Generator Tool or Software comes into play – You can generate or simulate Network Traffic uses multiple different types of Protocols to mimic real life network traffic to understand if your network becomes to congested or it can handle the “heat”. Some businesses have multiple branches that need constant communications across the WAN, including internet and telephone communications. If these links become over saturated, then it is possible for these important systems to grind to a halt so that you can no longer operate from these remote locations. Running network saturation tests with Network Traffic Generators is a great way to make sure that you can uncover any weaknesses on the system ahead of time. Below you'll find a list of our Favorite Network Traffic generators, along with some screenshots and download links! 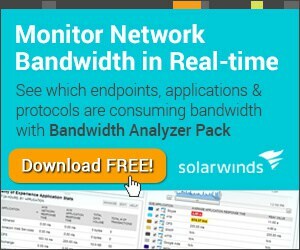 SolarWinds has created an application that will help you to identify and target very specific network traffic by allowing you to generate and create your own. This allows you to set a specific IP address or hostname that can be deliberately soaked with random traffic. This means that the performance of your network can be properly tested and vetted, allowing you to even set the size and percent of circuit bandwidth and then generate data for your WAN testing. It is a good idea to periodically test your network capacity and capabilities at set intervals, which helps you to stay proactive and not reactive. You can track UDP and TCP packets while you are flooding the network with random traffic so that you can check the operating conditions of normal network activity while load testing specific systems and applications. It is also a great way to load balance test your environment so that you can prevent any unforeseen drops in connectivity. The great thing about this application is that you do not need to generate legitimate traffic to run your tests, as it will do all of this for you. When you setup SolarWinds WAN Killer you can check and test network connections in real-time while testing load balancing and testing. This means that you can get the results that you need without creating problems on your network and applications with legitimate business related data and traffic. 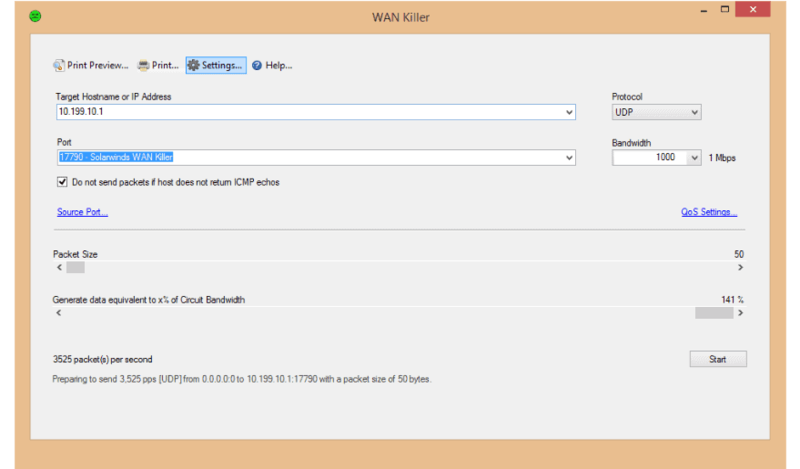 WAN Killer is able to equip you with the best methods of testing your network through specified IP addresses and hostnames. Particular ports and protocols are tested through heavy traffic, meaning that you can keep an eye on the specific data flows for your important applications and programs. For those that want to try out this awesome program a download link can be found right here. It will run for 14 days before you need to purchase as license. Ostinato is another packet generator that allows you to create your own streams of traffic, and it has an easy to use graphical user interface as well. It is all built on a powerful Python API which makes it an ideal application for automated network testing. You can construct your own network packets and send them at different rates, so instead of receiving packets for analysis like you would normally do which packet sniffers like Wireshark, you send out your own packets, which is the opposite of packet sniffing. This makes the application especially useful if you are testing specific data streams and connection types without having to actually run that software in your test environment. People that would use Ostinato are IT professionals such as Network Engineers and software developers that need to analyze and monitor the effects of certain data types, as well as how certain packets and protocols react with the projects that they are creating and working on. This has not been possible in the past, where special programs needed to be coded from scratch for such test functionality to be accomplished. Using Ostinato will help your skilled teams to perform at their best, which will ultimately lead to a better result when creating software. 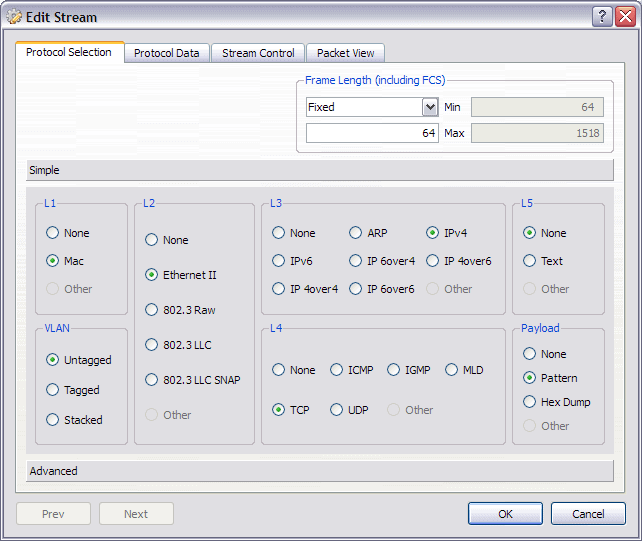 As a diagnostic tool, Ostanato is also invaluable for network engineers that need to generate specific data streams on demand, without the limitations of legacy solutions and products. 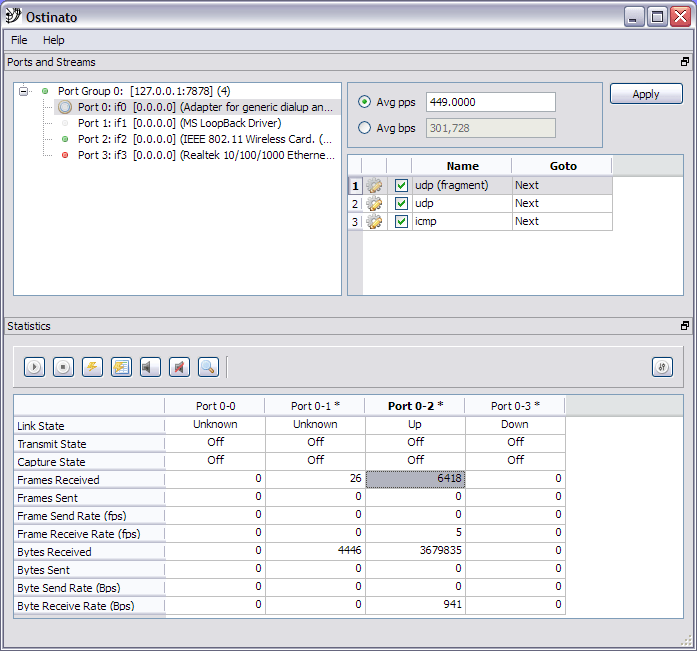 Ostinato is easy to use for both testing network load capacities, or as a traditional network testing tool. Users that have the Python API will be able to launch it directly as a Python app, while those that prefer the traditional Windows styled GUI can launch it via an executable. You are not limited to single streams, as multiple streams are supported, as well as stream rates, bursts, and packet numbers. There is support for all common standard protocols such as Ethernet/802.3/LLC SNAP, VLAN, ARP, IPv4, IPv6, IP-IP, and much more. The only thing to keep in mind is that Ostinato is stateless, and it cannot be used to generate web traffic. You can find the download packages here. Desktop bundles start at $69, while the Super Bundle is $129 at time of writing. 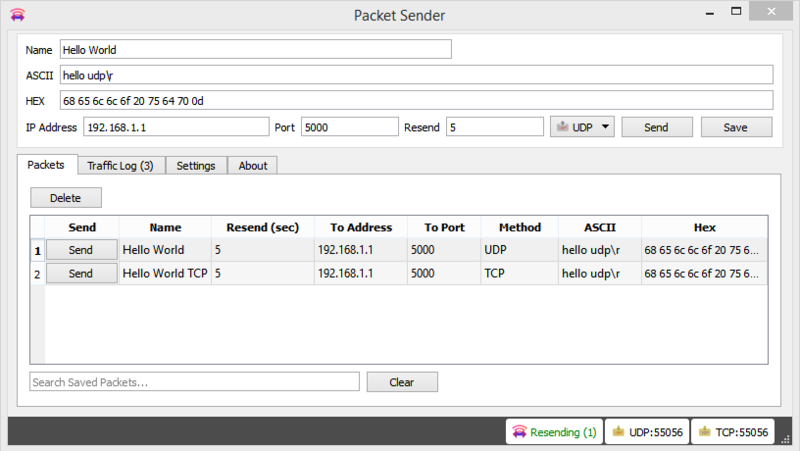 Packet Sender is a multipurpose application that allows you to send and receive multiple packet types such as UDP, TCP and SSL. It is configurable and will allow you to select the ports that you want to test, which means that customized testing is truly possible. Servers and clients are able to run this software simultaneously, giving you the ability to test in an uninterrupted and uniform way. There is a GUI and a command line, so you can use whichever interface you choose.The CLI comes with all versions of the software, so you always have access to it when you need it. Packet Sender works on Windows, Linux and Mac OS, which makes it a truly multiplatform solution for your testing requirements. Perhaps its most noteworthy attribute is the fact that it is open source and completely free, with no adds or bundled bloatware to interfere with your testing experience. Because it is a client/server install you can send and receive test data between 2 separate test machines, giving you scope to narrow down or broaden your testing methods as your investigations proceed. It has built in ASCII and Hex readers to that you can read all the data that you need to, in specific formats when needed. The command line aspect of this application is important because it allows you to automate and script within your test environment, which can really speed things up when you have multiple targets to deal with that would otherwise take too long to test. Other than the automation and scripting options that are available, there is also a hotkey function for one button operation. 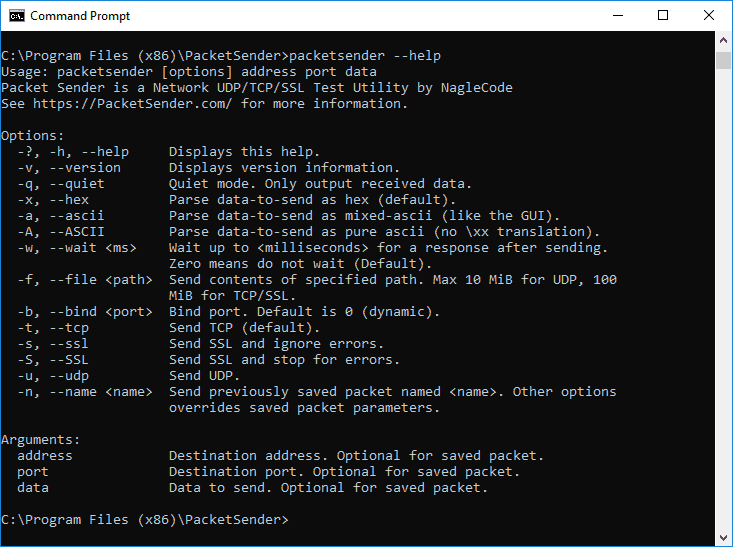 Packet Sender is useful as a malware analyzer because of the raw inputs that it works with when sniffing packets and data. It is also a good way to poke around your firewall to find holes, due to the client/server functionality of the application. If you want to download it for yourself then you can find the links to the installation packages for all the most popular operating systems right here. Pricing: As mentioned, the application is free and open source, but you can donate if you find the application useful. Nping is another open source application that allows users to create custom protocols and measure send and response times. 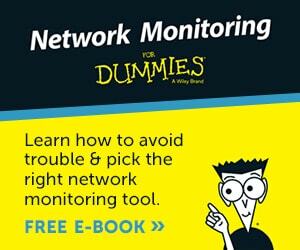 This is very useful for response analysis and response time investigations for network engineers. 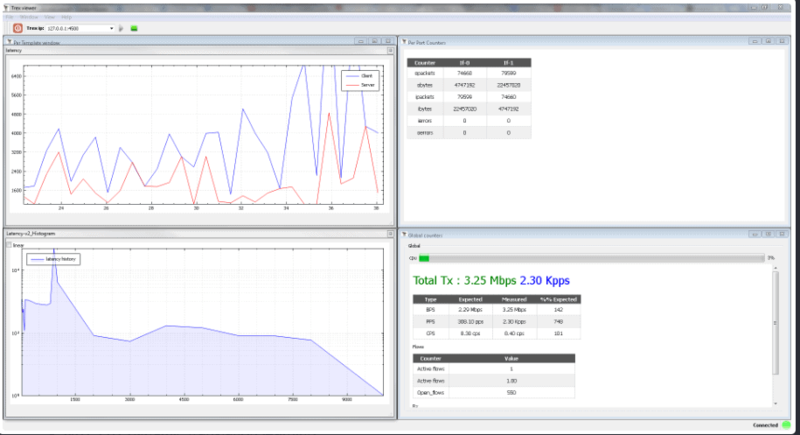 Nping will allow you to generate custom packets so that you can test most protocols. Protocol headers are also configurable with Nping, so you can fine tune your testing until you find the results that you are after. Nping is useful on several levels. As a basic ping utility it is very good, while more advanced features such as raw packet generation, ARP poisoning, DOS attacks, tracert and more lie just below the surface. Echo mode will give you a unique look at how your packets change during their journey to the destination, helping you understand what the conditions are for the data as it traverses the network. Nping is a command line tool, so if you are not into Linux, Windows or Mac OS CLI commands then you might struggle with this application a little in the beginning. Luckily it is very easy for CLI users to get into. There are many good reasons why you would want to use a CLI application like this. You can create custom TCP, UDP and ICMP packets, as well as ARP packets as well. You can include multiple target hosts, as well as target ports, so you can build custom scans that will help you to identify weaknesses and lapses in security on your network. This is a very handy application to have in your toolbox, especially if you do a lot of network diagnostics. This is a free and open source application that will help you to get to the bottom of many network specific issues that you face on a daily basis as an IT professional, so downloading it and testing it is a good idea. You can find a download package here, as it is a part of the Nmap application. 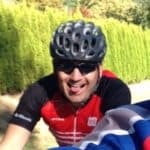 TRex is yet another open source project but it is not free. It is a low cost stateful and stateless traffic generator that runs off of DPDK. It is able to generate L4-7 traffic, which is primarily based on the pre-processing and playback of real traffic templates. TRex is also able to amplify client and server-side traffic, which means that it can scale up in a big way, up to 200Gb/sec with only a single UCS. All aspects of your packet data can be changed and manipulated, so you are able to customize the variables around your network tests whenever you need to. Stateful features are also available. TRex offers enterprise network interface support, with DPDL 1,2.55/5/10/25/40/50/100Gbps interfaces recognized and supported by the application. It provides a high scale of realistic traffic, up to 200 to 400Gb/sec with only one Cisco UCS. Latency and jitter is also measurable, while flow ordering checks, NAT and PAT dynamic translation learning features are also available. Stateless features allow you to create your own traffic streams, with customizable characteristics, while the large scale gives you support for up to 20 million packets per second. It allows multiple streams and the ability to change fields inside of each packet of data. It operates in Burst, Continuous or multi-burst modes, and has an interactive GUI as well as a CLI option for inputting your commands. Contact information can be found here for pricing enquiries. 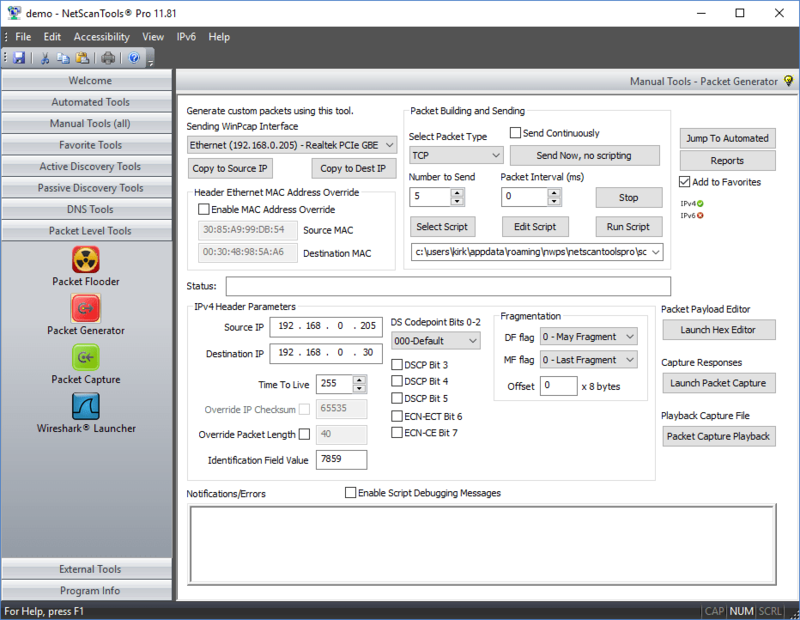 Packet Generator Tool is an application that will let you create your own TCP, UDP, ICMP, CDP, ARP/RARP and RAW packets. It only operate on IPv4, but that is usually enough for most people as the IPv6 implementation has not gotten to the point of universal adoption as yet. The program lets you do much of what you would expect from a packet generator. You have the ability to change headers, ethernet source and destination, as well as MAC address information, IP, TCP, UDP or ICMP headers as well. Download a 30 day demo from here. Starts at $250 – visit https://www.netscantools.com/pricing.html for more information. 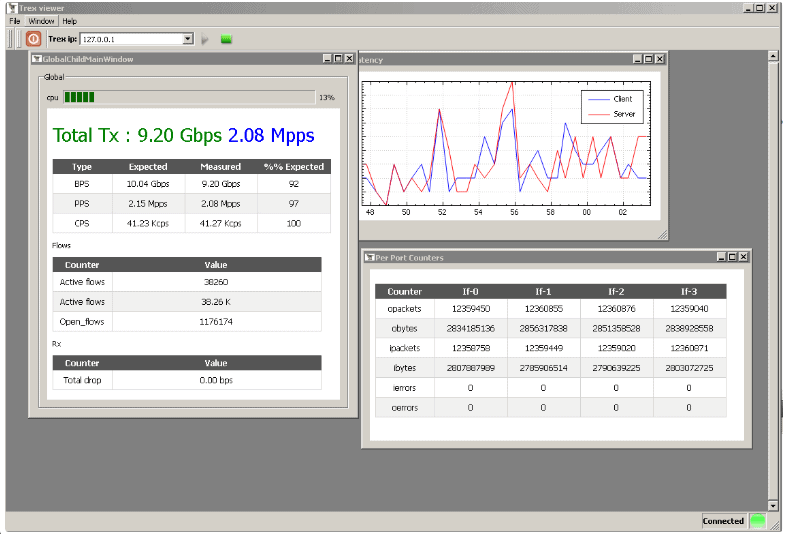 Network Traffic and Monitor is an easy to use application that allows users to quickly and easily monitor IP, ICMP and TCP traffic, as well as UDP packets. This gives you the ability to analyze the incoming traffic on your network, and allows you to run tests over the network such as stress testing and load testing. The main benefit of using this application is that you can emulate client and server activity, meaning you can see what is happening under certain conditions with no issues. This program lets users generate and measure different types of TCP traffic as well as UDP. Each installation of NTGM provides up to 20 UDP generators, 20 UDP clients, as well as an ICMP ping utility. The application itself is very easy to use and has all of the standard features that you might expect from such a utility – It has been designed with user friendliness in mind, so using it is really simple. 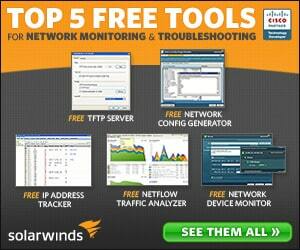 It is compatible with Windows and works very well as a network monitor and traffic generator. As we have seen there are plenty of options out there for the discerning network engineer or system administrator to choose from. This means that finding the right tool for you could be tricky, especially if the application that you want only has some of the implemented features that you are after. 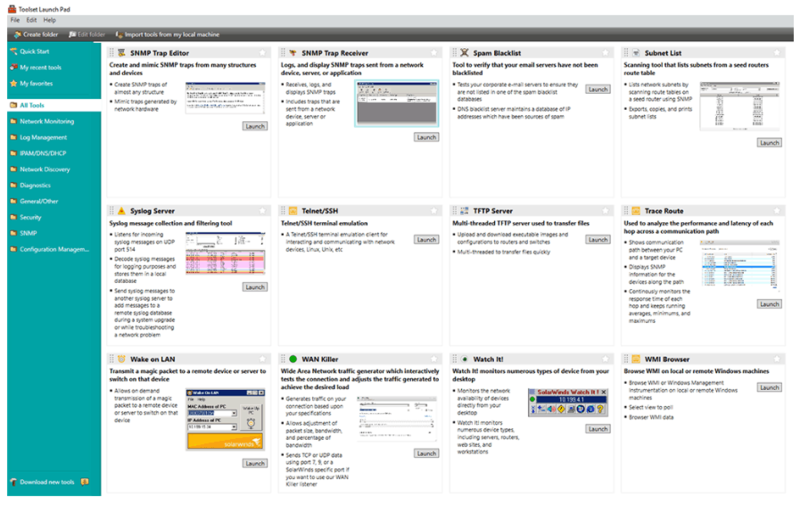 Setting up a test lab is a great way to start testing this software, so be sure to look at some of these examples, download and install the trial versions, and see for yourself which one works best for your requirements. Learning how to generate your own traffic and then learn how to use the information that you gather is a vital function if you follow a path in cyber security. These applications can help you to get there, so be sure to download and try them out until you find your favorite.